Down to Haywards Heath / Scaynes Hill for the fourth day of my vinegrowing course. I've got the transport arrangements down to a fine art now, meaning I no longer have to get up at quite such an ungodly hour to get there in time. I get the 07:36 train from Kentish Town, which with a connection at Farringdon gets me to Haywards Heath just before 9, and then I hop into a taxi from there to The Farmers in Scaynes Hill where the morning theory session is held. I've got into the habit of reading some of the relevant chapters of Stephen Skelton's incredibly detailed "Wine Growing in Great Britain" on the train on the way there, from which today the main takeaway was that Skelton is really in favour of steel posts for trellising systems rather than wood (given that wood inevitable rots / breaks). This morning's theory session started with a recap on vine nutrition, where Chris, the course leader, showed us photos of various vines with different forms of malnutrition, and we had to guess which mineral was lacking. We were mostly quite hopeless at this. The main focus for today was then site preparation / planting and then vine training systems (trellising). On the latter subject in particular, both from reading Skelton's book and from the lecture this morning, I was amazed about how even this seemingly straightforward subject area quickly got so detailed and complicated. There are many alternatives, however, as with pruning, where Guyot seems to dominate, it seems one system for trellising comes most strongly recommended - VSP (vertical shoot position), wherein you encourage the vines to do what they want to do (grow upwards) and just have a single curtain, which is easily accessible from either side. As much as the course itself, I think I actually enjoy the tea breaks / lunch break where we have an opportunity to chat with the other attendees. It turned out one of the attendees had planned to buy Frithsden vineyard (which I'd visited last year) but the sale ultimately fell through. After lunch we headed over to Rock Lodge vineyard for another practical session with Tom. 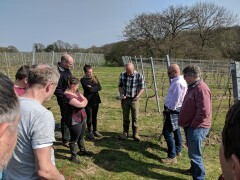 This time we continued on the morning theme of trellising systems, Tom demonstrated tightening the fruiting wires, then we also had a go at post-pruning tying down which was quite a satisfying job. Tom also got the tractor going and showed us how to grub up a vine. Although sadly for safety reasons we weren't allowed to have a go at driving the tractor ourselves, which clearly everyone wanted to. The practical session was cut slightly short by a sudden torrential downpour and hailstorm. I got quite wet getting from the far corner of the vineyard where we'd been tying down the vines to the toolshed, the only place which had any cover. By time I got there it had pretty much stopped. One of the other attendees kindly gave me a lift back to Haywards Heath again, and I squelched into the Waitrose next to the station to see what local produce they had - I bought a couple of bottles of Sussex Wine (I was particularly excited to see Breaky Bottom in a supermarket!) and some Sussex bread and cheese. Took Erika for breakfast at Bear and Wolf this morning, and picked up some dry cleaning on the way back. Once back at home we set about trying to moth proof our cupboards. Since moving to this flat four years ago we'd seen no evidence of clothes moths, but just in the last couple of months we'd spotted what appeared to be a couple of the little blighters fluttering about. Hopefully the combination of having sent a bunch of my tweed suits off to be dry cleaned and putting lavendar / cedar / tea tree oil in the cupboards today will nip this in the bud. In the afternoon, I headed down to see friends in Honor Oak Park in South London, where we had arranged to hold a tasting session for three English sparkling wine "prestige cuvées". Full write-up of that here. Tried out the wine thermometer again. Bought a wine thermometer gadget for the upcoming tasting I was organising. Andrew was back from his long trip to the Far East / Australia today, so we toasted his return with some ESW in Granary Square. A day without much of a plan. Ended up with an impromptu playdate with one of Erika's school friends. 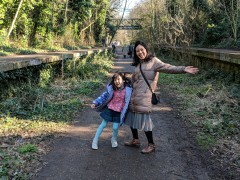 Erika had a birthday party to attend in Finsbury Park, so I decided we should walk there along the Parkland Walk, which runs along the route of a former railway line from Highgate to Finsbury Park. Surprisingly nice weather for the time of year! The first buds on the cherry blossom tree are very near to flowering now! Went for a drink with Ricardo in the Camden / Euston area, culminating in dinner at Murger Han. Started reading Hilaire Belloc's The Four Men: A Farrago, and it seemed appropriate whilst reading a book about Sussex to drink some wine from Sussex. Took the day off work as it was the first day of Erika's half term holiday. 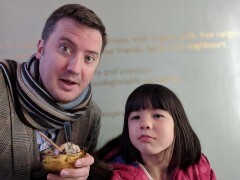 Didn't do much in the end though, mostly stayed at home, and took Erika to the Pineapple for lunch. Afternoon stroll around Hampstead Heath, and some early signs of spring. Had an evening out with Ricardo and Jim in Soho. Went to the garden centre in the morning to buy more potted herbs to put in the newly assembled herb stand. Took a stroll across Hampstead Heath around lunchtime, and stopped for lunch at the Parliament Hill Cafe. After that went to a kids event at Keats House in Hampstead. Quite a mixed bag of a day. Jeremy came round in the morning to assemble thhice herb stand Mum had given me for Christmas (which I'd struggled with myself). Ramen in Soho for lunch. I bought a white truffle from Gelupo, and also got my hair cut. Back at home we had afternoon tea including some macarons. Then truffle pasta for dinner. Leon was working in London today, so we met up for some late afternoon / early evening pubs around Farringdon. Erika decorate a cake to celebrate the anniversary of when Chie and I first met. Had a Nest Thermostat installed today, and then spent the evening obsessively looking at thermometers because I wasn't convinced it was working properly. Erika's second tooth came out today! Took Erika to the swimming pool in Finchley in the morning - it has a wave machine. After that, shock horror, lunch at McDonald's (!!!) then back home for the rest of the day. I had stayed the previous night in Petersfield, thinking I could then make an early start this morning and cover a lot of ground despite the limited daylight hours this time of year. I had an ambitious goal (which I did not achieve) to get all the way to Exton. Although I did manage to set out from my hotel at 8am, my choice of accommodation (influenced by not wanting to be too far from the marvellous Harrow Inn) meant I spent the first hour just getting back to Buriton, which was still not even quite on the South Downs Way. This would probably have been a more sensible place to stay the night in terms of getting on the South Downs Way as quickly as possible this morning, but trying to get here in the dark last night after several pints of cider in the Harrow Inn would probably have not been a great idea. It was rather a grey and dreary day today, and in addition to this my enthusiasm to be out walking was further dwindled by the mostly urban character of the start of the walk, as well as having perhaps ever so slightly too much cider at the Harrow Inn the previous evening. So that first hour to get to Buriton definitely felt like a bit of a trudge. It was nice to pass through Buriton again though, it's quite a pretty village, and thanks to a tip off about one footpath underneath the railway being closed, I took a slight detour by way of the pond, down a little country lane leading out of the village, under the railway, and through Appleton's Copse, where there were some signs of a former chalk mine. That was all pleasant enough. So it wasn't until an hour and twenty minutes into my walk - probably about 4 miles - that I saw my first South Downs Way route marker of the day... and then I almost immediately left the South Downs Way again. Here the South Downs Way passes through the Queen Elizabeth Country Park, and takes an oddly indirect route. I had the sense when planning today's walk that anywhere called a "country park" would not comprise the sort of countryside I really like, so decided it best to just take the shortest route through that I could. I was right - it was rather bland, managed woodland, probably fun for mountain bikers (who had some dedicated slalom type runs) but not very interesting as a walker. Unfortunately the A3 forms a major obstacle here, and what I really would have liked to do is head almost due West from Buriton, and skip the country park altogether, but alas the only crossing of the A3 require heading a fair way South, before then having to head back North again the other side. The other side of the A3 things did start to improve a bit - a reasonably steep climb up Butser Hill, albeit still very close to the A3, felt a bit more like the wide open countryside I'd come to love along the nicer parts of the South Downs Way. From the top I could see all the way to the sea. Slightly disappointingly after this the path followed a road for a bit - but it was at least not a very busy one, along a ridge, with reasonable views either side. It was around this point that I started to weigh up my options for where I should aim to end today's walk. I'd originally thought I might try to get as far as Exton, which would probably have been about a five hour walk in total, but there didn't seem to be much in the way of public transport from there - as far as I could tell no buses run from there to Petersfield on a Saturday. Another option was West Meon, which was almost as far, but at least had buses. The easiest option was to aim for East Meon, also reasonably well served by buses, and the closest of the three villages. Given a combination of the dreary weather, the long trudge at the start to get out of Petersfield as well as the dull bit going through the Queen Elizabeth Country Park (not to mention the fact I was a bit hungover and also now starting to get quite hungry) I was just not really enjoying the walk today as much as I had some of the previous outings. So I decided to cut my losses, and plumped for the cop out - I would head for East Meon. 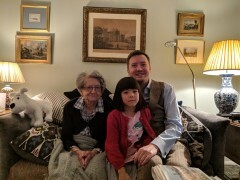 It would also mean I could get back to London with some of the afternoon still remaining, and spend some time with Chie and Erika, who I felt I'd been neglecting a bit having stayed overnight in Petersfield. So at Hyden Hill, I said goodbye once more to the South Downs Way, and headed down the hill towards East Meon. I felt emboldened in my choice given that this took me past the source of the river Meon, which felt like a point of interest I might not have seen otherwise. Close to the source little ponds had formed with crystal clear water, and what I almost certainly incorrectly assumed to be wild watercress. Then through farmland, until I eventually reached East Meon, just before midday. East Meon is a very pretty little village, with an interesting mixture of architectural styles - some thatch, some exposed timerframe, some rendered, some tile clad, some bare brick, and some download stone cladding. A bit of everything. The village has a church, the spire of which I had seen from atop Hyden Hill, two pubs, and a village shop (which I heard some of the locals complaining about later when I was waiting for the bus). I poked my nose in at the shop hoping I might find a souvenir or some interesting local produce, but it seemed to be a Happy Shopper, stuck in a 1980s timewarp, with a lot of half empty shelves, and rather depressing. I can see why the locals were a bit unhappy with it. I took to surveying the two pubs, to choose where to have lunch. Ye Old George Inn looked a bit gentrified from the outside. Not really my sort of thing. The Izaak Walton seemed to be much more the locals pub, and was a bit basic on the inside - alas not in a charming rustic way. Still, I chose there for lunch, and was glad of the hearty unpretentious vegetable lasagne of the type you only really get in pubs. Just before 1pm I got the bus (perfectly on time) back to Petersfield. The bus went past the hotel where I'd stayed the previous night on the way into town, and I found it slightly disheartening that thanks to the almost U shaped route I'd taken, my four hours of walking this morning had only actually transported me about 4 miles as the crow flies, and it was all undone with a 15 minute bus journey. I managed to hop on a train almost immediately at Petersfield station, and was back in London by 2:30. I had still been mulling over whether I might be able to get to a proper rural wassail somewhere this weekend, and was considering one which would be on Saturday night in Herefordshire, but eventually decided against it as it's just such a big undertaking getting to remote parts of Herefordshire, and I also felt bad for abandoning Chie and Erika for most of the weekend. As it turned out the girls had plans to visit friends this evening, and also Erika was going to a trial music lesson tomorrow morning, so it occurred to me the ideal window for some sort of jaunt involving an overnight stay would be tonight rather than Saturday night. Thus the original idea of going to a wassail morphed into continuing my fragmented journey along the South Downs Way, with an overnight stay in Petersfield which would have the twin benefits of giving me an early start on the walk the next morning, and affording me the opportunity to return to the wonderful Harrow Inn, which I had fallen in love with when visiting for the first time in February last year. So I clocked off from work a bit early (it was a Friday after all), got the tube to Waterloo, and from there got the train down to Petersfield. On arrival in Petersfield it occurred to me that the mile (ish) long walk from the station to the pub, which is just beyond the outskirts of town, was going to be ever so slightly challenging as it was really quite dark, and the latter half of the walk was down an entirely unlit country lane. I did eventually have to resort to using my phone as a torch for some sections, as I managed to trip on potholes a couple of times. I suppose this added to the sense of adventure of getting there. On arrival at the pub, about 6:20, it was packed! By which I mean there about a dozen people in there, which is enough to fill the main bar room. I found myself a little bit of space in the corner, and very happily settled in with a pint and a packet of crisps. After a while I got talking to one group of people there, in particular a very nice chap called Phil, who, as it turned out, shared some common interests. He and his group of friends had an ongoing mission to seek out very special unspoilt pubs like the Harrow, and travel round the country looking for them. They have a list they share between themselves, and I was impressed that as I reeled off all the pubs I could think of that might be on such a list they seemed to know almost all of them. Having hopefully therefore proved my credentials as a fellow connoisseur Phil took my email address and offered to send me this much coveted document. It was a delight to be in these wonderful surroundings, talking about old pubs, morris dancing, and other related topics. After the first beer I moved on to the local cider they have at the Harrow (Herons Crest I think), which was particularly good to accompany one of their excellent Ploughman's lunches (yes I know it was dinner time). I was in heaven. Gradually the initial throngs dwindled, and eventually a bit before 9 I had the pub to myself. This was also quite lovely, and I took the opportunity to take a few photos, having not wanted to spoil the atmosphere for the other customers earlier on. I also spent a while admiring all the fixtures and fittings, and in particular spotted some prints of the Harrow on the wall for sale. I bought them both. Eventually I decided I should probably call it a night, aware that part of the point of coming to Petersfield tonight was to get an early start on my walk the next morning. So, back down the dark country lane, and, as it turned out, more dark country lanes and footpaths around the outskirts of Petersfield to get to my hotel, which was slightly out of town. Partly because of the appeal of the facelessness of being able to book online, and partly because of uncharacteristic recent outburst of frugality, I'd decided to stay at the Premier Inn. This incredibly bland, banal, modern, chain hotel experience was of course a bit of a jolt after the magic of the Harrow Inn, but at least I had my prints with me to try and brighten up my room a bit. Cleared the Christmas tree away in the morning, then went to the Bankside Wassail in the afternoon. Chie made the vegetarian version of karaage (Japanese fried chicken) for dinner. Walked across Hampstead Heath and had lunch at the Flask in Highgate. Went to see Shakesperience in Leicester Square. Took Erika to Wahaca for lunch. Then bought a plunger. Erika's cousins came to visit us in London. I was pleased to discover I'd have the opportunity to fit in one last walk along the South Downs Way before the end of the year, as Chie and Erika had planned to go visit friends in the daytime, so I was left to my own devices for the day. I actually made a relatively early start this morning, managed to leave home around 8:30, and was at Waterloo station by 9, with a full half hour to buy tickets, and also procure breakfast and lunch, before the 9:30 train to Haslemere. Following some fairly lengthy research into the logistics of how best to get to and from the next section of the South Downs Way, I eventually decided it would be best to get the bus from Haslemere down to Midhurst, then a second bus from there to just South of Cocking, where the South Downs Way crossed the road. This meant buying the rather grandiosely named "Gold AD Dayrider" ticket, which I believe allowed me unlimited usage of buses in the Stagecoach network for the day, for the sum of £8.60. This did actually mean I'd end up skipping a short section between Graffham and Cocking, a couple of miles perhaps. As there seemed to be no easy way to get back to Graffham by public transport, and not wanting to rely on the vagaries of taxis in rural areas, plus the fact I had fairly limited daylight hours again, I decided to just write that off. Despite my comparatively early start, the tube, train, and two buses to get to the starting point of the walk meant it was about 11:20 when I was finally underway. I'd planned to walk to Petersfield, and that should apparently take 4 to 4 and a half hours, so there was just about enough daylight to achieve this from that point on. The weather was a bit uninspiring today, although I suppose for the time of year it could have been worse - it wasn't extremely cold, nor did it rain, it was just unrelentingly grey, which rather subdued all the views along the route. As you can probably see in the pictures everything looked a bit colourless and washed out today, and that never really abated at any point. Regardless, I was still happy to be in the great outdoors, enjoying the freedom of another walk along the South Downs, even if it didn't have quite the same aesthetic appeal I have seen on other walks earlier this year. Like the previous section, much of this walk was again through a distinctly agricultural landscape, and that was certainly the case for most of the first hour. However, in patches it did break out of this mould. An hour into the walk I arrived at the Devils Jumps, a series of Bronze Age burial mounds. This was the first time I'd really encountered such a notable sign of ancient civilisation along the South Downs Way (or at least the first time I'd really noticed one) - I'm sure the South Downs must have plenty, perhaps the path just doesn't happen to pass directly by so many. Earlier I had overheard a couple in Marks and Spencer in Waterloo station discussing whether or not to take advantage of the "meal deal". I seem to be struggling to enunciate why exactly, but I found this really depressing, and somehow emblematic of the fact that we as a civilisation have completely no idea who we are any more. Being now alone amidst the remnants of a society from several millenia ago felt very poignant. The contrast seemed very stark, and it was hard to imagine the day-to-day decisions made by those buried here were ever so trivial. A short while later, I had a slightly odd encounter, which to some extent dovetails with the pondering of times past provoked by the Devil's Jumps. It is of course common when out walking to encounter other walkers, and as appears to be the etiquette a brief greeting is exchanged, but, in my experience, it's extremely rare for any further discourse to ensue. So I was slightly surprised, a little after passing Buriton Farm, when I said a cursory hello to a man stood on the path, and rather than a similar cursory greeting, he replied "What do you look like?". I was a little taken off guard by this, but assuming he was referring to the tweed suit I like to wear this time of year whilst walking out in the countryside, I attempted to make light of the situation by saying "It's tweed, surely everyone in the country wears tweed?". It's a useful lesson in a situation such as this, in the opening gambit with a complete stranger, to remember that senses of humour are finely tuned engines which need to be calibrated over time. For them to be compatible relies on shared understanding. My jovial remark relied on the assumption that it would be understood I was, for comic effect, adopting the persona of a naive city dweller, with a completely unrealistic image of life in the countryside. I thought I had added sufficient hamminess to my delivery of this statement so as to make the humorous intent clear, but apparently not. "Nobody wears tweed. ", he replied, rather factually. I decided against pointing out that that wasn't in fact true, given the clear evidence he was currently looking at. Attempting to rationalise, he asked "Did you go to public school?". "No." I replied, ever so slightly offended by the social profiling that I was apparently now being subjected to, when all I wanted to do was go out for a walk. "You look like something from a hundred years ago! ", he continued to opine. This seemed like safer territory, we had transitioned from an apparent accusation of elite status to a presumed attempt to categorise me under the vintage clothes umbrella. Although as it happens I don't actually own many vintage clothes, and the particular tweed suit I was wearing was modern. "A happier time, in many ways. ", I replied, and given the look on his face in response almost immediately regretted it. Obviously, by just about any objective quality of life metric this would be an extremely hard stance to defend, but I was still thinking about the meal deal at Marks and Spencer. A moment of mental arithmetic later I recalled that a hundred years ago was in fact the end of the First World War. I attempted to steer the focus away from this, and instead pointed out that I just have no truck with modern synthetic fabrics. He then pointed out that he can't actually wear wool, because it irritates his skin. I suppose at this juncture we had just agreed to disagree, and he concluded our dialogue with the amusingly sentiment free: "Well all I can say is you look extraordinary. ", and we went our separate ways. A short while later I passed another couple, who just said he cursory hello as usual. Around 1pm I reached the top of "Beacon Hill", which must be the most oversubscribed name for a hill in English. This particular Beacon Hill had nice views of the surrounding landscape, as I'm sure many of its namesakes also do, and so I decided to pause here for lunch. To eat the sandwich I had bought earlier from Marks and Spencer. Which, I hasten to add, I had not purchased as part of the meal deal. My peace and quiet was interrupted by a large family group who, I got the impression, lived locally, and were here as part of a New Year's Eve tradition to walk up to the top of this particular hill. I was a bit envious. They were taking group photos by the trig point - I offered to take one for them so they could all be in it, then I continued on my way. A short while later there was another nice viewpoint, near the car park for Harting Downs, but I chose not to linger - the weather was still a bit too underwhelming to persuade me to do otherwise. After the car park the South Downs Way crossed over the road, and the terrain changed from the open hilltops of the last couple of miles, to a pleasant wooded hillside. This then opened out into a series of lanes and tracks until it came time for me to leave the South Downs Way for today's walk, and head into Buriton. I had been to Buriton with Chie once before, back in 2010. It was on a recommendation from Dad for nice old pubs he knew in Hampshire (and indeed somewhere on today's route I had crossed over the border from West Sussex into Hampshire). Although today's visit was very brief - just time for one very quick pint - I am pleased to report it is still very much unspoilt. I would have liked to stay a bit longer, but was aiming for a particular train back to London from Petersfield, and still had another 2.5 miles or so to go to get there. On our previous visit, in the absence of an Ordnance Survey Map, we had followed the road from Petersfield to Buriton, but I spotted on the map ahead of today's walk there was an alternative path - Hangers Way - through the fields, and thought that would probably be a bit more pleasant. On arrival in Petersfield I went to the General Wine Company, very conveniently located near the station, as I had done earlier this year when I'd come to the area with friends to visit the Harrow Inn. I picked up a couple of bottles of local English sparkling wine - Upperton and Hambledon. Had a pleasant train journey back to London, having effectively a small private compartment on the train, and was back at home by 6. Took Erika to Winter Wonderland. Bec and Jessica came over to Bristol to spend the day with us today, we went to We The Curious (Bristol's science museum) and then later on back to the Christmas fair for a bit. Towards the end of the afternoon we got the train back to London. Picked up a Zipcar and drove to Abergavenny in the daytime to see Vera and Robin, picking up Louise on the way. In the evening went for a swim then dinner at San Carlo back in Bristol. Got the train to Bristol in the morning, lunch at Stable (cider, pies and pizza), a bit of shopping in the afternoon, then Caribbean food for dinner followed by an evening visit to the little Christmas fair near our hotel. Went to the zoo in the daytime. Presents in the morning, a rather unsuccessful visit to the Pineapple in the afternoon, then Christmas dinner and a home made yule log in the evening. Went down to Belgravia / Chelsea in the daytime, mainly because we wanted to try to buy a new fridge in Peter Jones, but while we were in the area had lunch at Olivocarne. Had Christmas drinks for local friends this afternoon. I wasn't entirely expecting to have the opportunity for a walk today, but I discovered over breakfast that Chie and Erika had plans to meet friends from Japan in the daytime, and as the weather was surprisingly nice for the time of year I thought I should make hay while the iron's hot so to speak. 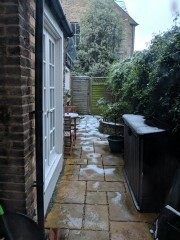 So it was perhaps a later start than was ideal, which matters particularly this time of year in terms of daylight hours, today being the day after the shortest day. Anyway it still seemed worthwhile making a go of it, and I was on the 10:36 train from Victoria down to Amberley to pick up where I left off last time. Given that I only had at best 4 hours of daylight from arrival, I decided there was no time to squander on such fripperies as lunch, so I had eaten a pasty on the train prior to arrival, and once I got to Amberley at midday I purposefully set off on my walk. Thankfully the South Downs Way passes by the station here, so in a matter of minutes I was on it, and in open countryside. didn't really have much sense at the time of being amidst the South Downs. Compared to today's glorious blue skies and surprisingly mild temperature for the time of year the surroundings were barely recognisable. That familiar section only lasted the first 15 minutes or so though, and after that I was venturing into pastures new. Not long after that first fairly flat section I started to head up a hill, with corresponding wonderful views of the surrounding landscape. Today's walk was a less "wild" section than some previous parts of the South Downs Way - the path was flanked on one side or the other (often both) by farmed fields pretty much the whole way, although apart from one farm where I crossed a road I didn't pass through any human habitation for the whole route in between Amberley and Graffham. The views were pretty much uninterrupted throughout, enhanced by clear winter skies. It was also the most mud I had encountered to date on my journey along the South Downs over the course of the past few months. In the summer the ground had been baked hard by the heatwave in July and early August. It must not have been a particularly wet Autumn as this distinctive grey downland mud, born of the chalky soils, was something of a novelty today. I was a little unsure where to end today's walk. I'd originally considered trying to get as far as Cocking, from where I might hopefully be able to get a bus into Midhurst, and from there to Pulborough, but getting to Cocking was apparently going to take in excess of four hours of walking, and having only started at midday it would be dark before I got there. The original compromise I'd come up with had been to walk as far as Upwaltham, where there appeared to be some kind of bus service (the 99 between Petworth and Chichester) - but it sounded a bit of an odd system, you had to prebook at most stops, so when I got to the bus stop where the South Downs Way crossed the A285 I decided to just press on, and try my luck at Graffham instead. So I continued for a while longer after crossing the A285, for a distinctly muddy section up Littleton Down which offered nice views back towards some of the rolling hills I'd been walking over earlier on. It was just after 2pm by this point, but already the winter sun seemed to be hanging a little low in the sky. Just after 2:30 I got to the point where I'd be leaving the South Downs Way for today, to follow a footpath down the hill into Graffham. This turned out to be quite a steep descent, through a wooded hillside, and made for an interesting bit of variety from the hilltops I'd mostly been walking on this afternoon. The entry into Graffham reminded me of arriving in Kingston near Lewes - a track eventually turned into a street, and one of the first buildings I saw was the rather picturesque church. Part of the reason I wanted to come to Graffham today is that I'd found on the web that there's a holiday cottage next to the church, which looked rather nice, so I thought it would be good to come and take a look with a view to possibly staying there a couple of nights in the New Year for the next section of the walk. Graffham was a pretty little village, particularly the older parts near the church. With my mind still on how I was actually going to get home, I decided the best strategy might be to aim for the village pub in Graffham - the White Horse - and see if they had any recommendations for local taxi firms etc. On arrival at the White Horse I was surprised by a couple of things - first there were electric car charging points outside - not what I expected from a country pub in a tiny village filled with quaint old cottages - and secondly inside the pub were lots of other people wearing tweed! Normally I expect to be the only one, but I think they'd all been on a pheasant shoot or something. Anyway, my instinct proved correct, and I was indeed able to call a taxi from here to get me back to Pulborough station, with enough time for a pint first. Lunch at Fortnum and Mason to meet Kyle and Hannah's new baby, and dinner with the girls at St John in the evening. 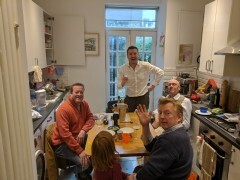 Lunch at the Pineapple, Erika's carol concert in the afternoon, then in the evening drinks and dinner around Holborn with the usual suspects. Went to Shikumen for lunch, then had a wander around the City of London, and went to see the Mithraeum exhibit. Took Erika to Bear and Wolf for breakfast in the morning. Chie and Erika went off to a party for most of the rest of the daytime, while I mooched around at home as the weather was too miserable to go out for a walk. In the past few weeks I seem to have developed a constant urge to be outdoors - I think as some combination of my new found love of walking and possibly as a reaction to spending so much time working from home. Unfortunately this time of year isn't particularly conducive to that, both in terms of the weather and the amount of daylight. To that end today I decided to finish work early, and arranged to meet Ricardo to see if we might catch the last few rays of the day's sunlight from the top of Primrose Hill, with a bottle from the mixed case of English sparkling wines I hadn't tried before that I'd recently ordered. Today I decided to try the Hindleap Blanc de Blancs, from Bluebell Vineyard in Sussex, actually not that far away from the Plumpton College vineyard where my vinegrowing course take place. I thought this was pretty good, and while probably better suited to a summer's day, the 4 degree air temperature did help to keep it chilled! Although we pretty much missed most of the sunset by the time we arrived, the views from Primrose Hill at dusk as London was lighting up made for a very nice backdrop. Once the wine ran out and we were starting to get cold, we retired to a nearby pub - the Landsdowne - chosen primarily because it was close by looked warm inside. This turned out to be quite a convivial sort of a place, and we got talking to some neuroscientists from UCL, presumably having their Christmas party here. 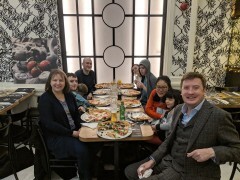 After that we slightly oddly went to do some late evening shopping at Morrisons (Ricardo wanted to buy some batteries and some cheese) and then rounded the evening off with a deep fried pizza at Rossompodoro. Actually went to the office Christmas party this year. It was terrible. Only stayed a short while and instead went to the Captain Kidd and a nearby Italian restaurant.